Many international retail companies are still dropping the ball when it comes to the representation of women in senior management positions, a senior executive from the US has said. The newly appointed chief technology officer of Revlon, Chau Banks, believes that while there’s a positive trend among many big name brands to support female leaders in the industry, there is still a lack of understanding of how to address legacy cultural issues in many companies. 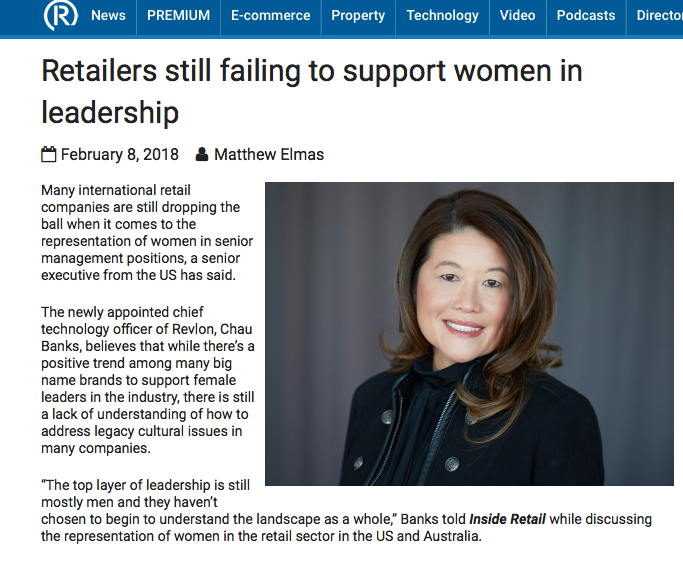 “The top layer of leadership is still mostly men and they haven’t chosen to begin to understand the landscape as a whole,” Banks told Inside Retail while discussing the representation of women in the retail sector in the US and Australia. Banks’ comments come in the wake of the #metoo movement, which has seen scores of women come forward with stories about sexual assault and harassment in the workplace around the world. According to Banks, retail companies need to be more open to creating workplace environments that don’t just invite women in, but also support them and their careers. “More and more boards are collectively looking at supporting women, and some have placed quotas [on representation], but I’m not seeing it broadly. In many cases, when these positions are being filled, the net result is that there are more men, or women lose out to them for these positions,” she said. The former New York & Company, Coach and Abercrombie & Fitch leader agreed that many 50-100 year old retail companies were struggling to keep pace with cultural change, but speaking from her experience thus far at Revlon, Banks said that things are approaching a tipping point. “It’s becoming more of an opportunity than an obstacle. Businesses want to be able to think bigger about inviting women to the workforce and helping them to advance,” Banks explained. Gender diversity at the highest levels has been an ongoing issue for Australian retailers, with a 2016 report on the issue by the National Retailers Association revealing that only 24.8 per cent of CEOs or managing directors in the Australian retail industry were female. Broader management fared better at 40.4 per cent. Bec Brideson, founder of a consultancy dedicated to gender intelligence, believes that ushering in change within retail companies will require speaking to current management in a familiar language – sales. “In FMCG, homewares, electronics, finance, there’s an assumption that men and women buy these things equally…but the question is, who is really making these decisions? You often see men carrying lists around because even though they might be purchasing, they’ve been sent for a particular brand at a particular place,” Brideson said. According to Brideson, many retail companies are missing out on a crucial insight into female customers and are thus missing out on opportunities to maximise revenue by adjusting things like marketing tactics and promotional calendars. “There’s a lot to be said about having that firsthand experience and walking a mile in her shoes,” Brideson said. However, more than just the gender of leaders needs to change, added Brideson, noting that many of the largest consumer brands in the world have been built and operated by men. “We need to change more than just the gender of the people in the business, we have to change the culture and how businesses operate – men and women need to learn to see it through the opposite gender’s perspective. “It’s about putting gender on the agenda. It’s not about quotas or hiring more women, it’s about understanding the intelligence and the market advantage that you can get from more deeply understanding what gender can do for your business,” Brideson said.